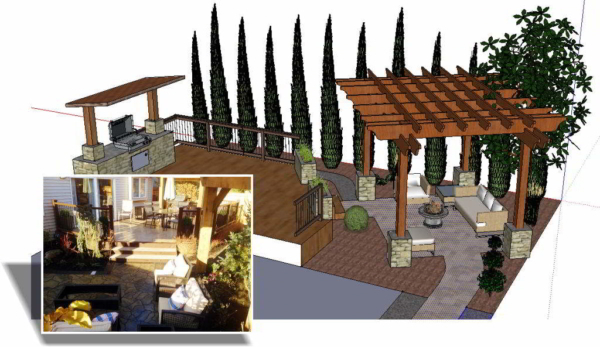 Design Services - Fuller Landscaping Inc.
Every property is unique and every client is different; choosing a custom landscape design company is a crucial step in the process of transforming your property. We believe that a good design melds dreams and ideas into a living reality. Let us turn your dreams into a beautiful and functional landscape environment – one that you will enjoy day and night for years to come. In creating a design for you we take your home’s style of architecture and interior into account and create an outdoor space that flows from your interior design. Our free-of-charge initial consultation takes place on your property. In this meeting we ask questions to determine your needs, evaluate existing conditions and explore the possibilities for your custom landscape design. Based on this conversation we will submit a landscape design proposal including estimated cost. You will see from this that our rates and methods for landscaping design services are highly competitive and completely oriented around your desires. The next step is to draw preliminary landscape design that will include the details and features of your property. We will meet with you to discuss any changes, deletions and additions. We appreciate and welcome your detailed involvement throughout the landscaping design process. Specific construction features and layout. Specific plant placement with size, species and quantity of plants. We will also include a detailed and itemized estimate for installations.